In all, Grant Park lived up to its promise as Chicago’s cultural and civic center. Grand promenades, groomed lawns, and numerous bridges and fountains, along with modern installations of art and three major historic cultural institutions for the public--the Art Institute, the Shedd Aquarium, and the Field Museum of Natural History--all distinguish the park. 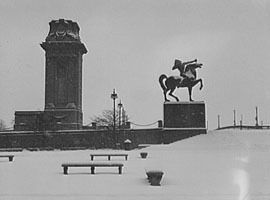 Statues of Christopher Columbus, Abraham Lincoln, Ulysses S Grant, and various other equestrian sculptures provide visual focus for various areas. Built in 1927, the Clarence Buckingham Memorial Fountain is a monumental focal point. 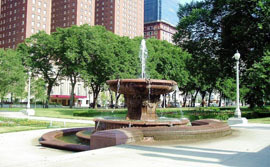 The park hosts public appearances of famous people, special events, and festivals and serves as a neighborhood park used for baseball games, ice skating, tennis, walking, jogging, and other amusements. Grant Park’s street address is 337 East Randolph St. in Chicago, IL. The park is bounded on the north by Randolph Dr. and the Chicago River, on the east by Lake Michigan, on the south by McFetridge Dr., and on the west by Michigan Ave. The park is open Monday-Friday 9:00am to 10:00pm and Saturday and Sunday 9:00am to 5:00pm, and is wheelchair accessible. Call 312-742-7648 for information or visit the Chicago Park District Grant Park website. For information on visiting the Art Institute of Chicago, see the Art Institute website. For information on visiting the Shedd Aquarium, see the aquarium website. For information on visiting the Field Museum, see the museum website. The Grant Park National Register nomination form can be found here.